Relevance A new class of molecule (4-hydroxy-4-hetarylcyclohexa-2,5-dien-1-ones) bearing a new pharmacophore (‘quinols’) has been identified with potent activity against renal, colon and breast cell lines in the NCI 60-cell panel. In vitro applications Antitumor activity observed in HCT 116 (GI50 = 40 nM) and HT 29 (GI50 = 380 nM), and in breast cancer cell lines. Potent inhibitory effect in NCI 60 cells (GI50 =16 nM and LC50 = 2.24 µM). Notes Exhibits a mean GI50 value of 16 nM and a mean LC50 value of 2.24 uM in the NCI 60- cell-line screen, with LC50 activity in the HCT 116 human colon cancer cell line below 10 nM. 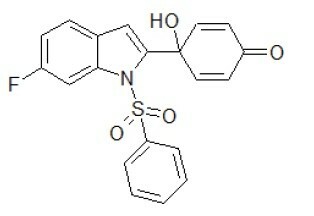 Compound available for screening or similar studies. For larger quantities (>20mg) please contact Ximbio.